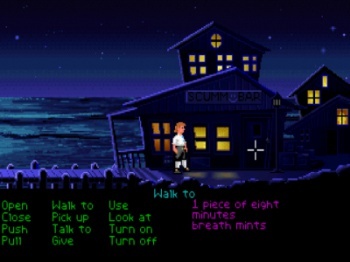 Ron Gilbert wants to talk to Disney and make another Monkey Island game. When Disney acquired Lucasfilm, it got the licenses to a lot of old LucasArts adventure games in addition to the coveted Star Wars rights. Ron Gilbert, the man behind the first two Monkey Island games, was not happy when he discovered that his beloved brainchild had gone to a company that's generally happy to sit on IPs without making new entries for them. Not content to let his baby languish in a Disney filing cabinet somewhere, Gilbert now plans to engage the Mouse head-on to see if Monkey Island could return to its creator. "I would love to contact them at some point," says Gilbert, who currently works for Double Fine Productions under Tim Schafer. "I haven't done anything yet but I definitely want to." Gilbert thinks that Disney would be hesitant to pull the Monkey Island license out of storage when it would be much easier and more profitable to use the popular Pirates of the Caribbean franchise for its piratical needs. "Pirates of the Caribbean is a rip-off of Monkey Island which is a rip-off of the Pirates of the Caribbean ride," he explains. Still, Gilbert can't begrudge Disney its success, given Monkey Island's origins. "It's hard for me to get too mad at Disney when I ripped them off originally." While there's no hard timeline for when Gilbert wants to speak with Disney - or even a way to tell if such a talk would be successful - he has big plans if he's able to reacquire the license. "I would love to ... be able to really make the game I want to make." Given Gilbert's current place of employment, this means that any future Monkey Island games would come out as Double Fine titles under the leadership of adventure game guru Tim Schafer. It's admittedly difficult to find a flaw in this system.